These are two more releases in EMI's ongoing mid-priced "Great Recordings of the Century" series. 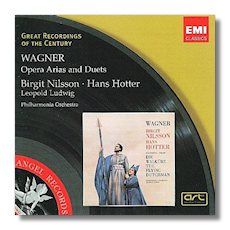 The Wagner CD comes from sessions in May and October 1957 that had been put together by producer Walter Legge, partly in hopes of encouraging EMI to record a complete Ring cycle. The resulting LPs did well, but foot-dragging and bad timing caused the hoped-for Ring project not to come to fruition. In any event, it was "scooped" by Decca when Nilsson (and also Hotter) signed with that label not long after these EMI sessions. Nilsson was not quite 40 in 1957; Hotter was 48. She was at her vocal and interpretive peak during these sessions. If you don't like the sound of her voice here, you won't like it anywhere. Hotter sounds more dry and frayed, although 48 really is not that old for a Wagnerian bass-baritone. Also, he is not as charismatic here as he might be. In particular, his Wotan is not larger-than-life and not imposingly godlike, although it is likeably human. As a result, I found myself more focused on Nilsson in the duets from Holländer and Walküre, although that's not to say that Hotter lets her (and us) down in any way. It's just that her voice is so striking here; nothing seems beyond her grasp. Predictably, her solo numbers are an unalloyed pleasure from first note to last. Leopold Ludwig probably is on no one's short list of great conductors, yet I feel that there's something special about his work here. He brings a dignity to these excerpts that is largely missing in the conducting of Decca's Sir Georg Solti (for example). True, there's little spectacle, but an expert is clearly at work here, and if you like your Wagner sober but flowing, Ludwig is your man. EMI's solution to the problem of how to package 82 minutes of music is to put the Liebestod on its own CD, perhaps as a sort of bonus disc. I'm not sure how many people will bother to put a CD that doesn't even last for 8 minutes into their player, and that's a shame, because Nilsson is radiant here. (I would have preferred two 41-minute CDs.) In any case, the pair of CDs is being sold for the price of one, so at least consumers are not cheated. The only monaural selection is Senta's Ballad, and everywhere, the sound is clear but unspectacular. The booket contains full texts and translations, and a good essay, newly penned by Mike Ashman. "Dignity" also is a word that can be applied to Lucia Popp's Mozart, although her voice, and her approach to the music, is nothing like Nilsson's. Popp was only 53 when she died in 1993, the victim of brain cancer, and hearing her on this CD, it is only natural that one feel both saddened and cheated. 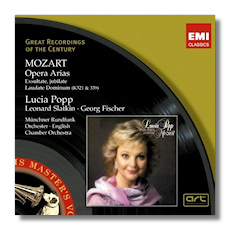 As John Steane writes in the introduction to this CD, "Lucia Popp was everyone's favorite," not just for her voice but also for the sunny personality behind it. That's not to say that arias such as "Welche Kummer" from The Abduction from the Seraglio lack the requisite sadness. It's just that there was no trace of nervousness or neurosis behind her silvery tone. That made her a particularly valuable singer in Mozart. In fact, it's not much of an exaggeration to say that, with her bright yet warm tone, her intelligence, and her poised musicianship, she was born to sing Mozart's music. As her career progressed, she moved from traditional soubrette and coloratura roles to roles more generally associated with lyric sopranos. Thus, this CD presents not only her Susanna (and Cherubino!) but also her Countess Almaviva, and both her Donna Elvira and Donna Anna. The only problem is that the operatic material all was recorded in 1983, and Popp did not work as hard as she might to distinguish between these characters. Thus, her Cherubino is not unlike her Susanna, and her Susanna is not unlike her Countess. Similarly, characters as different as Ilia and Fiordiligi seem more similar than different. All, however, sound absolutely beautiful, and much of the time, that satisfies me entirely! The sacred arias, recorded in 1967, reveal how much her voice grew in 16 years, although one can't say that it grew older! Again, the conducting on this CD makes an unexpectedly positive impression not because of what it is, but because of what it is not: fussy, pushy, and unsympathetic. Both Slatkin and Fischer let Mozart (and Popp) breathe, and so the music unspools with glorious inevitability. The engineering is excellent too, particularly the early digital sound in the operatic arias. Again, texts and translations have been included. There are lots of Mozart discs out there featuring this soprano or that one, but Popp's is one of the most beautiful and loveable, even if it isn't the most interpretively varied.